These easy black eyed peas are made with dried peas, slow cooked with a simple combination of bacon, ham hock, and seasonings. 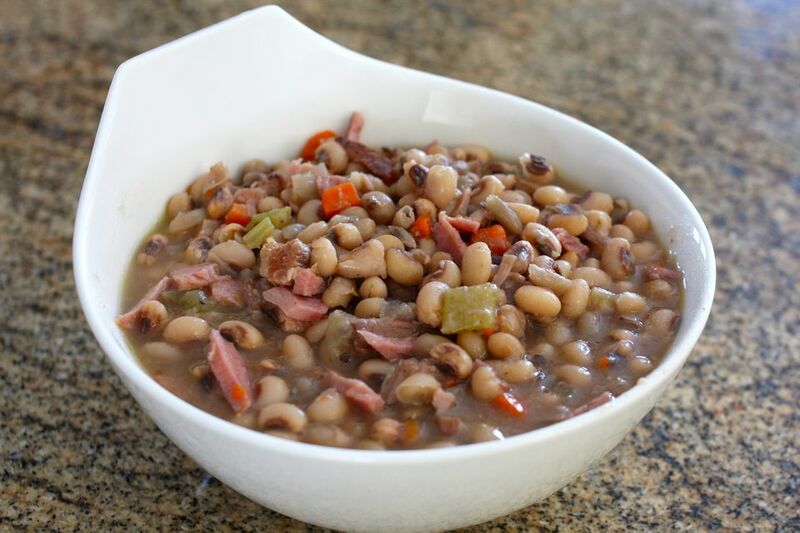 Black-eyed peas are often served on New Year's Day to bring good luck. The peas are said to represent coins​ and are eaten to bring prosperity in the coming year. Put the peas in a large saucepan or Dutch oven; cover the peas with water to about 3 inches over the peas. Bring to a boil, reduce heat, then simmer for 15 minutes. Meanwhile, place the ham hock, sliced onion, celery, carrots, bacon, pepper, and garlic in the slow cooker. Add 3 cups water. Drain the peas and transfer to the slow cooker. Reduce heat to LOW, cover, and cook for 5 to 7 hours. Remove the ham hock from the pot. Remove the meat from the hock and shred or chop. Add the meat back to the peas. Taste and add Kosher salt and freshly ground black pepper, as needed. Serve the peas with freshly baked cornbread and enjoy! Many people have difficulty with peas and beans becoming tender in the slow cooker. This can be caused by salt or acidic ingredients, the hardness of the water, or the age of the peas or beans. An overnight soak isn't essential for black-eyed peas, but if you regularly have trouble with peas and beans becoming tender in the slow cooker, go ahead and soak them overnight. Add about 1/2 to 1 teaspoon of crushed red pepper flakes instead of cayenne pepper. Add 1/2 cup of chopped green or red bell pepper to the crock pot along with the onions. Add a teaspoon or two of jalapeño peppers to the crockpot. Instead of a ham hock, add a meaty ham bone along with leftover or purchased diced ham. Replace the ham with about 12 to 16 ounces of sliced or diced smoked sausage, such as andouille or kielbasa. For Southwest flavor, add a teaspoon of chili powder and 1/2 teaspoon of ground cumin to the crock pot with the peas.